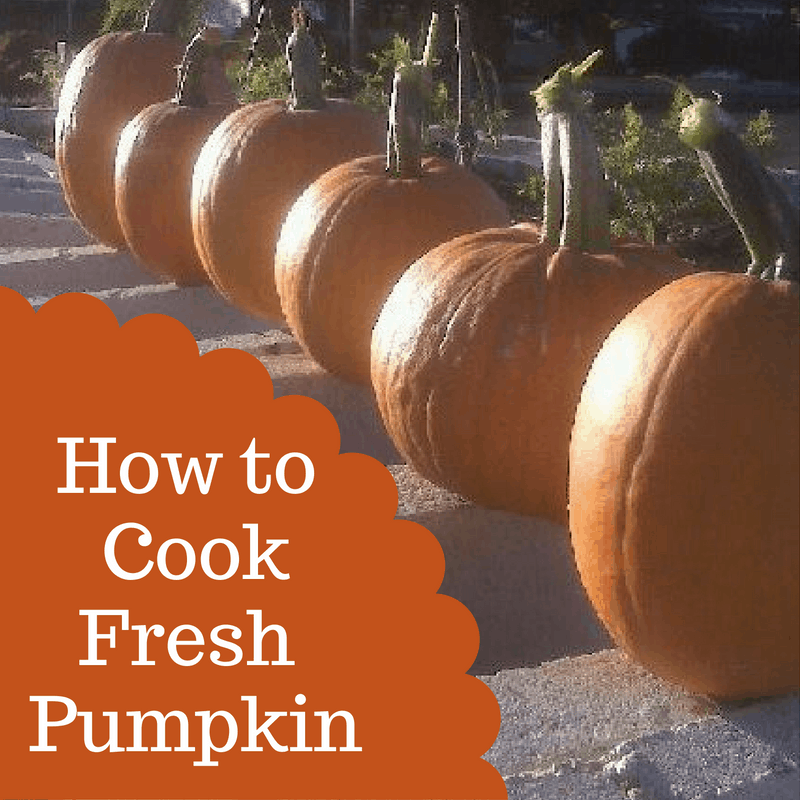 So You Want to Cook Fresh Pumpkin? The first year I was out on my own, I thought it would be cool to make a pumpkin pie with real pumpkin, not just the canned kind. Needless to say, it not only took forever, it gave me a new appreciation for Libby’s. The pumpkin in my pie didn’t taste nearly as good as canned pumpkin. It was stringy and watery. A huge disappointment. And a huge mess. Most (but not all) culinary pumpkins are much smaller than their jack-o-lantern cousins. Their small size makes them easier to manage in the kitchen, cutting them into pieces and cooking them. They also have better flavor and texture. Popular cooking pumpkins have names like Pie, Sugar, Cheese, Cinderella, and Sugar Pie. 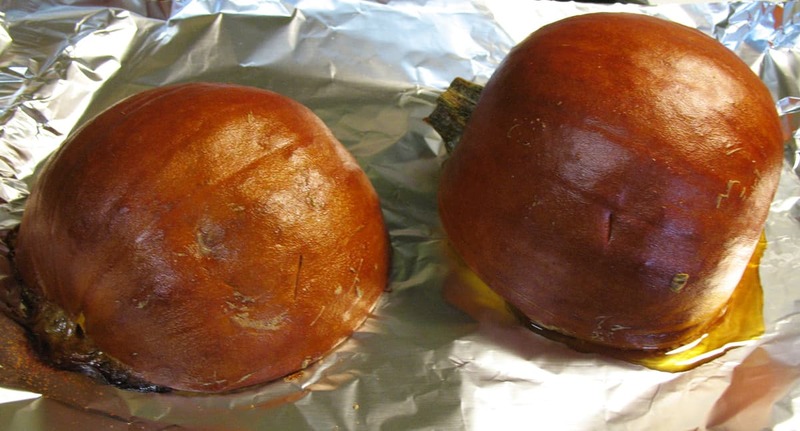 There are several ways to cook fresh pumpkin, however the prep work for all methods are the same: cut the pumpkin in half and remove the seeds and membranes. From there you can bake it (my preferred method) on a cookie sheet covered with foil. Bake in a 350-375 degree oven for 1-1.5 hours (the length of time depends on how big your pumpkin is). Another method is to boil the pumpkin, which requires a bit more work as you need to cut the pumpkin into quarters (or smaller) so that you can dump them into a pot of boiling water. Boil until tender. The third method in cooking fresh pumpkin is to microwave it. Again, you’ll have to cut it up a bit before placing it into a microwave safe dish. Microwave pumpkin for approximately 6 minutes per pound of pumpkin (times will vary depending on your microwave). Occasionally rearrange the pieces to help ensure even cooking. Regardless of your method, you’ll know the pumpkin is done when it’s tender and easily pierced by a fork. From there, remove the flesh from the skin and mash with a potato masher or puree in a food processor or blender. A typical cooking pumpkin will yield 1-2 cups of puree. And you know what? You’ll outshine Libby’s puree hands down! What to DO with All That Pumpkin? I’ll whet your appetite with my favorite pumpkin scone recipe (you can use fresh pumpkin puree or canned pumpkin in the recipe). They’re better than Starbucks pumpkin scones, which are pretty good. And here are some great (healthy) pumpkin recipes and some others that aren’t quite so healthy. You’re sure to find one (or more) that fits your craving. Enjoy!